There has been lots of baby talk on here as of late. I'm still amazed at how much time and attention tiny people (who seem to spend most of their time sleeping) require. Lest you fear that I have forsaken my love of All Things Fiber-y, I offer you a little proof that I have not. I decided to try knitting a pair of Houdini socks for Andrew- mostly because they're really, really satisfying to knit - and partly because I know he likes his socks snug, and these totally fit the bill. He was skeptical that he would like the fit of any socks that weren't ribbed from cuff to toe (the one problem with having a man who knows his knitting), but I assured him that he would love the fit of these. These are further than they appear in the photo (first sock is DONE! ), and I had Andrew try it on. I have a feeling that one Tall and Handsome Man will be having a serving of Crow with a side of Humble Pie shortly. 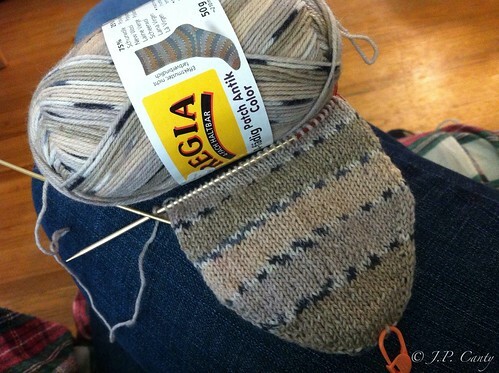 There are so many things I love about these socks; especially the yarn. Oh Regia, yarn of my heart. What I may love most is the bold 10-year warrantee on the label. Way to throw down the gauntlet, Regia. I am enjoying the knitting on these socks so much that I'm actually *excited* about knitting a fresh drawer of socks for Andrew. Somehow a drawer full of socks seems less daunting than finishing the sleeves on the sweater. It's all about perspective these days. These look like fun socks to knit. I had to add them to my queue. Thanks. The baby is adorable.